As 2013 comes to a close, we’d like to thank you for supporting the Great Bear Foundation, and our work conserving the world’s eight bear species and their habitats, though education and on-the-ground conservation projects. GBF is a member-supported, volunteer-driven organization, and we strive to keep our overhead costs low, so that donations, grants, and funds raised can go directly to our bear conservation projects. We appreciate your continued support, which we need now more than ever, as nonprofits face increasing economic challenges. 2013 was a big year for us. Most notably, we expanded our operations to include a Northern Office in Haines, Alaska, in addition to our main office in Missoula, Montana. The Alaska office is situated in close proximity to the Chilkoot River, a popular destination for observing bears as they fish for salmon. We are working hard on educational efforts on the Chilkoot River Corridor, helping bear-viewers and anglers to find ways to minimize their impacts on the bears and their habitat, while making the river safer for human visitors. In 2014, we hope to implement a new research project, monitoring the impacts of various human activities on the bears’ fishing success. We are also offering custom, small-group bear ecology field courses on the Chilkoot River during the salmon runs. These field courses not only offer the opportunity to observe and learn about bears in their natural habitat, but they also teach participants about threats to these bears, and how to observe bears in the wild with minimum impact on the animals and their habitat. Contact us for more information on field courses or other projects out of the Northern Office. Speaking of field courses, our Polar Bear Ecology Field Course in Churchill, Manitoba, was a great success this year. 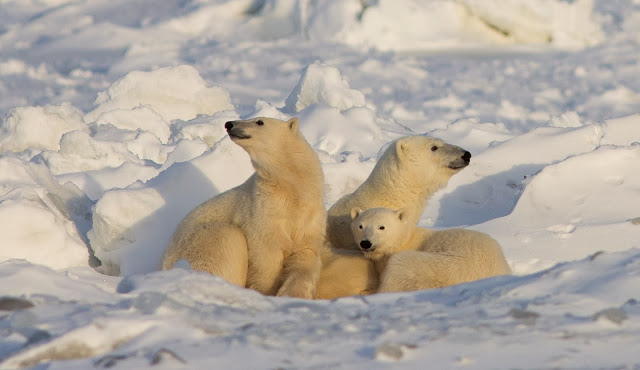 We enjoyed excellent opportunities to observe polar bears during their annual migration to Cape Churchill. It was also a great year for observing arctic and red fox. We saw the northern lights on our train journey north, and participants learned about arctic ecology, geology, climate change, tundra and the boreal forest, and the history and cultures of local people on Hudson Bay. We owe a big thank you to our volunteers, Dr. Frank Tyro, Bob Mires, and Lori Lambert, who helped to make the field course so successful, and to recurring course participant, Jeremy Patrick, who kindly donates the use of his beautiful photographs, including the one above. Next year’s field course will run Nov 1-11 from Montana, or Nov 2-10 from Winnipeg. Contact us or visit our website to learn more and enroll. Our Bears & Apples Project continued to successfully prevent conflicts between humans and bears in the Missoula area, thanks to our valuable volunteers who helped local residents to harvest domestic fruit from their yards so it wouldn’t attract bears to residential areas. All unwanted fruit went to volunteers, the Missoula Food Bank, and the Poverello Center, or was pressed into cider, making use of a healthy and delicious local food source. Thanks to grants from Yellowstone to Yukon Conservation Initiative and Patagonia, as well as donations from our members, we were able to hire a full-time Bears & Apples Project Coordinator this year, and Monica Perez-Watkins did a great job organizing volunteers and managing the project. GBF continues to offer our Bear Basics educational programs free of charge to schools and other interested groups in Western Montana and Haines, Alaska. We’re also happy to travel further to deliver these programs, but may need help with travel costs. Visit our website to make a donation to Bear Basics, or any of our other projects! Our documentary project on GBF President and co-founder, Dr. Charles Jonkel is making progress, as we edit the volumes of excellent footage and interviews we’ve collected over the last few years. The project is a collaboration between GBF and Salish Kootenai College Media, and you can watch a preview of the film-in-progress here: http://www.youtube.com/watch?v=LeYPSEuQbss. You can keep up with GBF and our ongoing projects by following our blog, where you can learn about issues concerning bears and their habitats, and what we are doing to address them. You can also follow us on Facebook at https://www.facebook.com/greatbearfnd. As always, we at the Great Bear Foundation appreciate your support of our work on behalf of the bears and their habitats. We are a member-supported organization, and we could not continue these projects without your help. 2013 posed increasing challenges for nonprofits across the country, as grant cycles were delayed or suspended, due to the economy and the government sequester and shutdown, and those grants that remained available were spread thinner to accommodate more organizations seeking help. Bears face ongoing and new threats, as human populations grow, and our communities expand into their habitats, building new homes and converting habitat to agricultural use. More people in bear habitat means more contact with bears, and we need to work harder all the time to prevent conflict between people and bears. Please remember us for your year-end giving. We are so grateful for all your support so far.